Queen Elizabeth (GB) Your browser does not support any audio element. 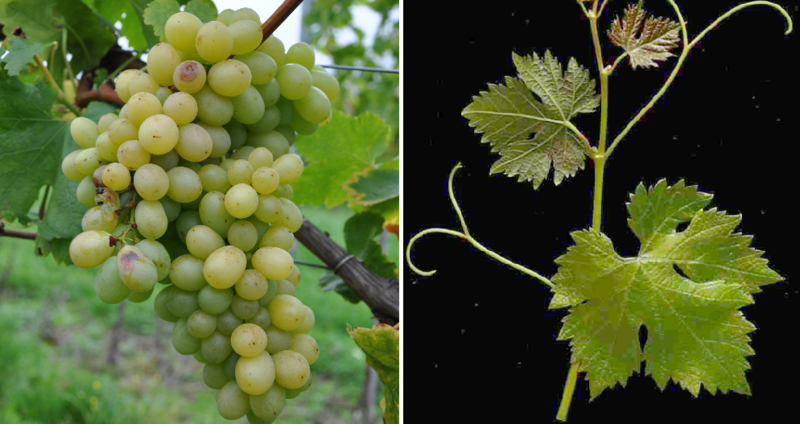 The white grape variety is a new breed between Duc de Buccleugh ( Muscat d'Alexandrie - openly bloomed ) x Ezeréves Magyarország Emléke ( Millenium grape ). Synonyms are Erzsébet Királyné Emléke, Mathias 165, Memory of Queen Elizabeth, Regina Elisabetta and Souvenir de la Reine Elisabeth. The crossing was made by the Hungarian János Mathiász (1838-1921) in 1870, who was a fervent admirer of the Austrian Empress or Hungarian Queen Elisabeth (1837-1898). On the occasion of her 50th birthday in 1887, "Sisi" was served with a wine (ironically she did not like wine). The variety was crossing partner of the new breed Pölöskei Muskotaly, It is mainly called table grape used. As a wine grape she brings golden yellow white wines nutmeg, The variety is in the winery Leopold Auer in the Austrian Kamptal cultivated and produced a grape brandy. In 2010, no stock was reported (Kym Anderson ). This page was last modified at 28 December 2018 at 17:29.